Your wreaths, swags, mailbox huggies, roping and crosses are made fresh daily on our farm. CALL AHEAD ORDERS ARE WELCOME. If you're hungry, we have popcorn, apple cider and hot chocolate in the gift shop, as well as Indoor Restroom Facilities! 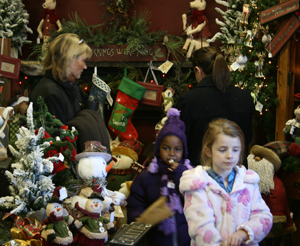 Visit us beginning the day after Thanksgiving and select your own Real Christmas Tree. Live (balled and burlapped) Norway Spruce and White Pine. 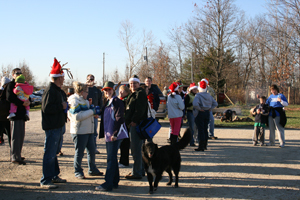 Visit our tree farm page for more information on the Christmas trees. Did Santa forget his Reindeer? Of course not, but we've got a few for you to enjoy! Let Cupid and Company stir up the magic and excitement of your Christmas holiday. 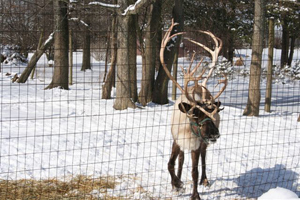 Renting our friendly reindeer for your next corporate event, promotion or private party will leave your guests, of all ages, experiencing the wonder and nostalgia of Christmases past. During their visit, children learn about reindeer and the Sami people who herd them. We teach about the life cycle of a Christmas tree and the little ones get to help make a fresh wreath. We've been known to go on a pinecone hunt when time permits. CALL TODAY TO RESERVE YOUR DATE FOR THIS HOLIDAY SEASON. DON’T BE DISAPPOINTED BY MISSING THIS OPPORTUNITY.